Dubai Exiles Under-18s girls blitzed their opponents by a combined score of 131-79 on a successful three-game tour of the UK earlier this month. After a highly successful 2016/17 season which included a fixture with Surrey school SGS Filton who toured Dubai, Exiles decided to test their skills against the best available teams in Britain. Girls rugby in Dubai is rapidly growing but the base of players and clubs is still relatively low so the club predominantly play sevens. On tour, however, Andy Williams’ side decided to play 10s. Working with a local tour company, Exiles got in touch with schools and clubs from across the UK, requesting strong opposition to benchmark themselves, and UAE girls rugby in general, against the best teams available. 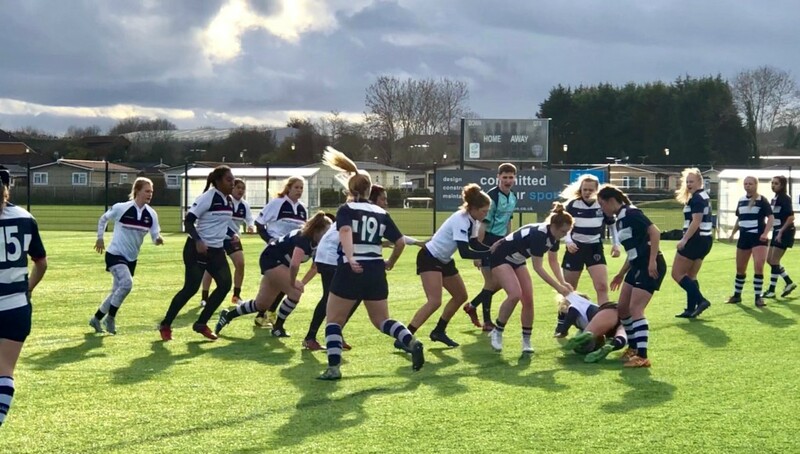 Cobham Rugby Club in Surrey has one of the strongest girl’s sections in the South East and Bristol-based SGS Filton is widely regarded as one of the top UK specialist sports schools, with a strong girls’ rugby heritage. Nelson, near Cardiff, also includes a number of U18 Welsh players and is considered one of the strongest girls’ club teams in the country. Having lost to Filton on their tour of Dubai last year, Exiles knew they had set themselves a tough schedule, but the girls committed hard to training and focused on skills development and building a superior level of fitness in preparation. Exiles (white) take on Nelson in their final and closest game of the tour. Weather was a major factor on the tour, with temperatures dropping to as low as three degrees at kick-off. The first game was an evening kick-off, made more challenging by the overnight flight. The girls landed at 07:30 on Friday, February 9, and played 12 hours later. Understandably, they endured a slow start and conceded an early try, but quickly established themselves with a couple of quick scores. From that moment on they dominated the game, only conceding tries to Cobham’s play-making No12. They eventually ran out 49-24 winners which was fully representative of Exiles’ control of the match. It gave the girls belief as they headed to Bristol for what was expected to be the toughest game on tour on February 12. Filton is a dedicated sports academy based in Bristol, which selects girls specifically for rugby and were previously unbeaten in both 15s and Sevens this season, only losing last season in the final of the Rosslyn Park 7s. Exiles knew that they would be physical and direct and true to form they started very fast. The game was played over 3x 20-minute periods and after 17 minutes Exiles were 19-0 down. Their first try, however, seemed to change the game and Exiles’ superior fitness then started to show and, coupled with an increasingly physical defense, they started to dominate. Injuries eventually led to the game reverting to a sevens format and that further played to the UAE side’s strengths. In a barnstorming game, Exiles came back to win 55-38. On to Cardiff for a Valentine’s Day clash with Nelson, where the weather conditions worsened still. Thankfully, the game was played on a 4G pitch. A very physical Nelson team were well organised and exploited Exiles’ handling errors in the rain to score first, but once again the visitors settled into a rhythm with some excellent defence and counter-attacking rugby. The conditions made scoring more difficult, but Exiles eased to a 27-17 win. 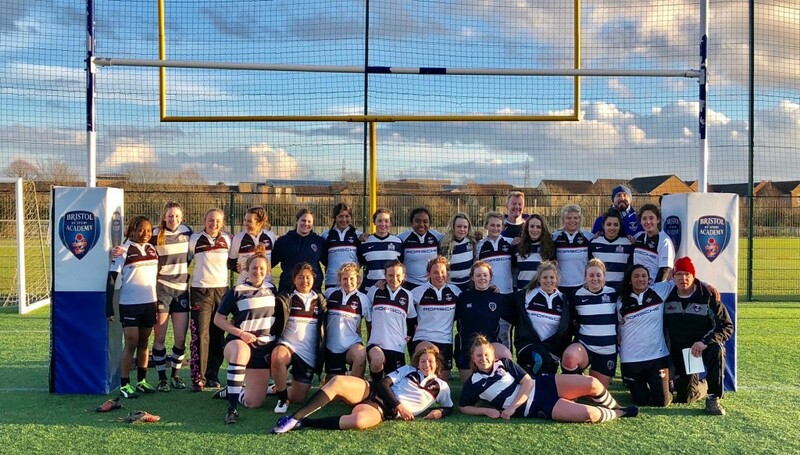 Head coach Williams said: “This was the first overseas tour by a girl’s rugby team in Dubai and our aim was to test ourselves and see how we compared to the best available teams in the UK. The Exiles U18 girls’ squad. Captain Chloe Williams added: “This past week of rugby has been the most challenging and rewarding experience our team has ever faced.